Bangladeshi taka has been gaining against the Indian rupee bringing respite to travelers but in the long-term will leave an adverse effect on the economy due to the large volume of import from the neighbouring county, say experts. The rupee (Rs) has been constantly falling against the US dollar with the conversation rate against the greenback standing at Rs 73.47. The falling Indian currency has brought respite to Bangladeshis travelling to the country for tourism or medical purposes. Tk 100 now fetches more or less Rs 90. But that’s not the case for trade with the country. “The trade between India and Bangladesh is in US dollars, which means imports from the country will now cost more,” said AB Mirza Azizul Islam, an adviser to the 2007-8 caretaker administration. Bangladesh would have benefitted if the trade was in rupees, he says. Falling rupee means that Bangladesh’s export to India may dive as the Indian businesses will have to spend more. In the last one year, taka has fell by nearly 4 percent against the US dollar while the Indian rupee lost nearly 15 percent in 10 months. 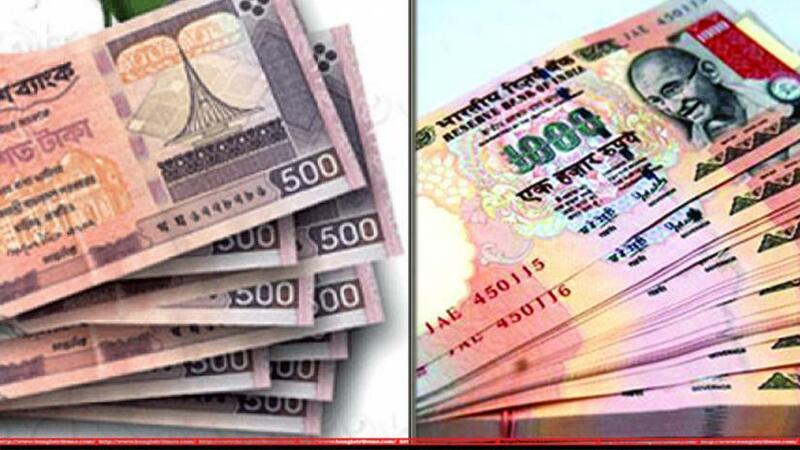 On Friday (Oct 24), a US dollar was traded for 73.47 rupees, which was 63.88 rupee on Jan 1. The taka-dollar conversion rate stands at 83.83 now against 80.85 a year ago. Imports from India are way higher what Bangladesh’s exports. The annual trade with the country is somewhat $9 billion. In 2017-18 fiscal, Bangladesh’s exports to the country clocked at $873.30 million while Indian imports were over $8 billion. Besides this, a good number of Bangladeshis travel to India for tourism, medical purposes and education every year. According to statistics by Indian tourism ministry, two million Bangladeshis travelled to the country in 2017, up from a little over half a million in 2013. Businesses, however, say a stronger taka will not hamper trade. “Indian exporters will gain due to the falling rupee, which will give them a competitive edge against Bangladesh,” said FBCCI President Shafiul Islam Mahiuddin. He, however, said that the weaker rupee will benefit Bangladesh as it import more from the country then it exports. According to the chief of the country’s top trade body, a falling rupee means imports will cost less as Indian businesses will have to spend less for exporting to Bangladesh.